The present building was built in 1974 at the same time that the single storey pre-fab next door was demolished. This temporary building had been constructed to replace the bomb-damaged original. Both No.96 & No.98 seemed to have always been closely associated with each other and No.96 may originally have been used as residential accommodation for workers at Sheppard's Grocers - it's difficult to tell from the earlier censuses. William was born in 1832 in Brundish, Suffolk. He married his wife Ann (b. 1831, Ipswich) sometime before 1861; as in that year they were both listed on the census in Highworth, Wiltshire ... William being shown as a 'General Grocer'. He wasn't shown on the 1869 Post Office Directory for Newmarket, but by 1871 he'd moved into the shop in the High Street and was also shown living their in 1881. By 1891 although he still owned the shop he'd moved into Heathside - No.36 Bury Road where he's still shown in the 1896 Kelly's Directory. Curiously in 1901 William and Ann (aged 69 and 70 respectively) were living with their son - the Reverend William J.L. Sheppard (who was born while the family were living in Wiltshire), in St. Peter's Vicarage, Stoke St. Mary, Suffolk ... but then, 10 years later in 1911, they were both back in Heathside(?). While they were living with their son in 1901 their cook Eliza Allard was living in Heathside. William lived until the grand-old-age of 98 and died on 18th February 1930, by then, although still in Bury Road, he was living in Althorp, moving sometime before 1916 (as he's shown in Althorp in Kelly's Directory of that year). Althorp first appears in the censuses in 1911, with Albert Upson living there, but it's not shown in the 1936 Street Directory and there's no house at that location today (which was somewhere between No.30 & No.32 Bury Road). Sheppard & Co., Grocers, at No. 98 High Street was listed in the 1969 - 1972 phone book - Nkt.2172, but as detailed in the Shop History above the shop actually closed in 1971. 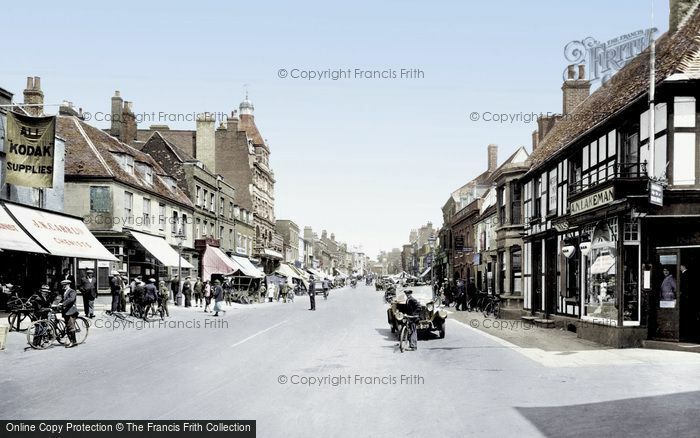 Photo of Newmarket High Street 1929 - Sheppard's is just to the right of the 'KODAK SUPPLIES' flag. On leaving school Henry went to work as an errand boy in Sheppard's. He was working his way up, and just before he joined the Army he was serving behind the counter. He enlisted in Newmarket on 7th August 1916. Two years later he was reported missing in France and presumed dead on 4th September 1918 and is commemorated on the Newmarket War Memorial. Charles Humphrey Simpson was originally just an assistant in Sheppard's in 1891. He married Ethel Gent in 1901 and in 1911 they lived in 8 Edith Villas, Rous Road. By then Charles was a 'Manager Grocer'. With them is their son Eric and daughter Hilda. They had a servant - so the grocery trade was clearly doing very well. Based upon the fact that there's no mention of the shop in his probate it appears that at sometime after 1916 William Sheppard sold the grocers. The name was carried on though and Charles Simpson is listed in Sheppard's in the 1926 Newmarket Street Directory, then in 1936 his widow Ethel had taken over as manageress. From these details though it's not known if the Simpsons actually did own the shop. Charles had died on 8th February 1932 and is his will he left Ethel £10,763 15s - so reiterating the above phrase - 'the grocery trade was clearly doing very well'. In the later years it's known from Tony Pringle that their son Eric (Gent) Simpson had continued as manager. Eric lived to the age of 86 and died in 1990 in Bury St. Edmunds. Note from webmaster - my Mum remembers Sheppard's grocery in it's later years - she said it was a dark and dingy place with shelves full of cans of food. The 1971 photo below shows how drab the building had become by then and although it hadn't been destroyed by the bomb that fell and demolished next door in 1941, it definitely looks as though it had suffered some significant damage - as the grand roof that was present in the early photos over both No.96 & No.98 is clearly missing. It's no surprise then that in 1974 the whole block was rebuilt. The name Oliver Hilton Shoes PLC was registered on 24th September 1981. Athough not all the details have been found, it's assumed that this was a contination of Hiltons Shoes before it - the shop in Newmarket was definitely renamed Olivers in the 1980s. 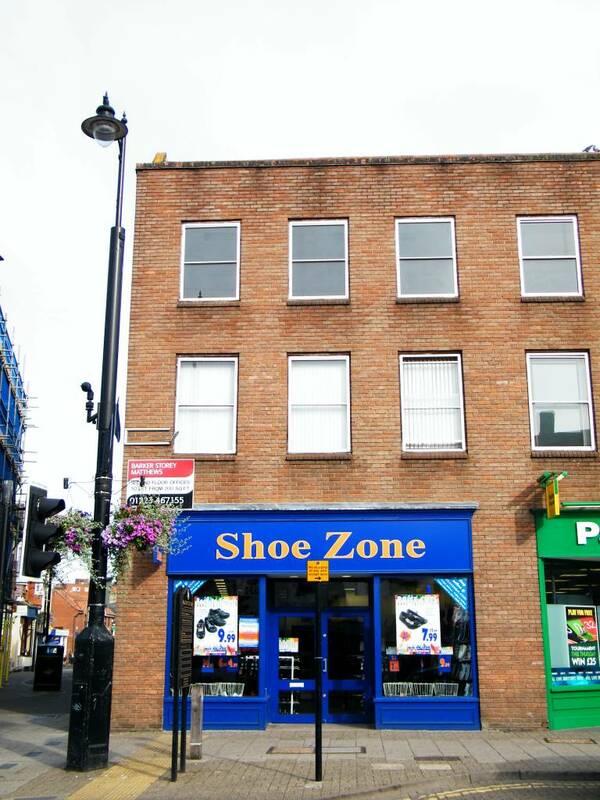 Shoe Zone acquired The Oliver Group PLC in 2000, rebranding all 258 stores with its own name sometime after. 'Sheppards High Sreet c. 1971', 'Centre of High Street 1927', 'High Street by Sheppards c. 1911' and 'From Sun Lane c. 1890s'.